The European project LIFE REGEN FARMING, led by the Basque Institute for Agricultural Research and Development NEIKER-Tecnalia, is seeking to produce healthier, more fertile pastures that offer greater plant biodiversity. The initiative sets out to identify, demonstrate and transfer best practices in meadow management and to propose that stockbreeders and farmers adopt regenerative agricultural techniques allowing the soil to be managed more effectively and sustainably. The new pasture management techniques can yield up to 14% more grass, as NEIKER-Tecnalia technicians have been able to show. 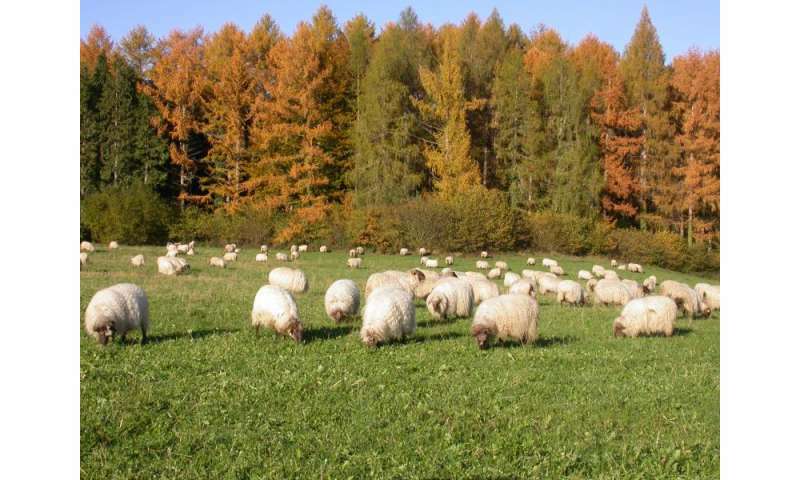 This research has been carried out on the Model Farm in Arkaute (Araba-Álava) with an experimental flock of milk-producing sheep of the latxa breed. In the trial it has been possible to show that applying regenerative agricultural practices results in plots of land that have the same grass offer and nutritional quality for grazing purposes, whereas preserved herbage on plots under regenerative management is significantly higher. The production of 'extra' grass could mean savings in the purchase of fodder and indicates the technical and economic effectiveness of regenerative management. What is more, the milk of sheep kept on regenerative (managed) pastures has the same yield and composition. Furthermore, the introduction of regenerative practices means that chemical fertilizers are eliminated, the consumption of feed concentrate is cut by 4%, and grazing time is increased by 7%. This means that the carbon footprint per litre of milk produced is cut by 10%. The trials in the LIFE REGEN FARMING project are taking place on pastures located on NEIKER-Tecnalia land in Arkaute; on land belonging to INTIA (The Navarrese Institute of Food Technologies and Infrastructure) in Roncesvalles (Navarre); and on commercial farms with pastures used by beef cattle in Orduña. The aim is to test these regenerative practices in a range of agro-climatic conditions in order to find out the outcome of these new practices when they are applied to soils of different characteristics. In recent decades, the intensifying of production systems has led to a fall in grazing, which means that these systems could clearly be affected by sustainability problems. The LIFE REGEN FARMING project is promoting the viability of certain regenerative practices like organic fertilizers, the direct sowing of pastures and the use of perennial species as well as regenerative or managed grazing. The advantages of managed grazing are as follows: fodder yield and quality are increased, plants can recover, the offer can be controlled, and the selection of animals can be avoided. This more consistent use of the pasture means that the droppings are also distributed more evenly and soil health is improved. What is more, permanent pastures have a considerable carbon-fixing capacity. All these beneficial effects can be achieved by adjusting the livestock densities, the time the animals spend on pastures, and the time the vegetation takes to recover.